YSL Rouge Pur Couture Lipstick in 53 (looks slightly more red here than it does in real life, sorry!) 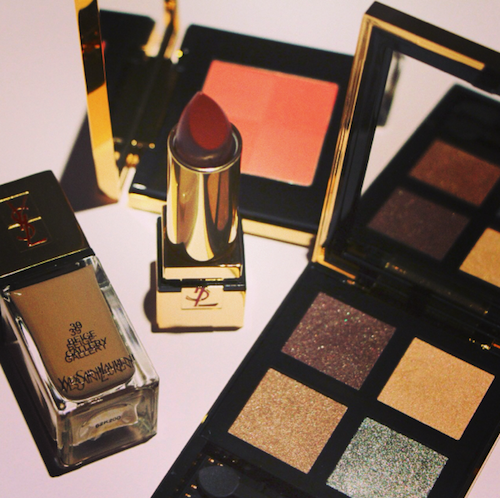 see here for all of the Pur Couture shades. Avon’s Shimmering Glow Bronzing Powder: this seems to have been discontinued. I must check these things before posting, really! 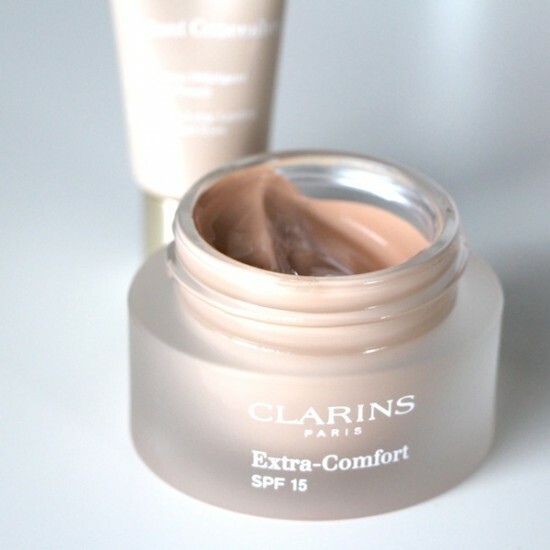 and Clarins Extra-Comfort Foundation, shade 105, see here. This new creamy foundation is great if you need medium-to-heavy coverage but want something quite moisturising. It’s incredibly rich in texture but it doesn’t slide off or move about – it lasts all day on me. The finish is excellent – really quite glowy for a full-coverage base, without being shimmery or oily-looking. I’ll try and pop it into a video soon so that fence-sitters can see it in action! If you want to take a look at shades or find out more info then take a look at Clarins.co.uk (£35) or Escentual.com (£28). Oily or combination skins beware – I have to use a matte primer and/or powder to set this if I’m in my oily PMT phase. Just a warning. It’s definitely aimed at the drier end of the scale!